The hype is real! 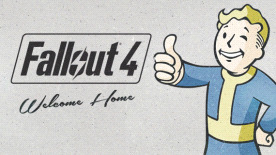 We've been waiting a long time for Fallout 4, and it's looking like it'll be an absolute treat! We're shipping up to Boston for this one, with Bethesda saying that we'll actually experience a little of the world before the bomb was dropped and everything went nuclear. The new crafting elements look fantastic, with true freedom to create armaments and defences on the fly, not to mention the ability to build our own shelters and bases too! Dogmeat's back, and thankfully indestructible given how much of a liability he was in Fallout 3, and we can't wait to get stuck once more into this richly-detailed post-apocalyptic setting!